React Native and Ionic are seen to be the most popular frameworks among developers across the world in the contemporary mobile app development market. Each having its own key features and restrictions, choosing the right technology for accomplishing project-specific objectives is no easy job. For that matter, developers are faced with the difficulty of whether to choose between Android and iOS or between React Native and Ionic. While Ionic was developed by Drifty, React Native has been developed by Facebook. When it comes to Ionic Vs React Native, there’s so much to be considered in mobile app development. Native apps, on the other hand, are being developed in the specific language that the platform they target requires, such as Java for Android, Swift OR Objective-C for iOS. Here, the code is not being shared across the different platforms, and their behavior differs. These have direct access to all the features provided by the specific platform with no restrictions. 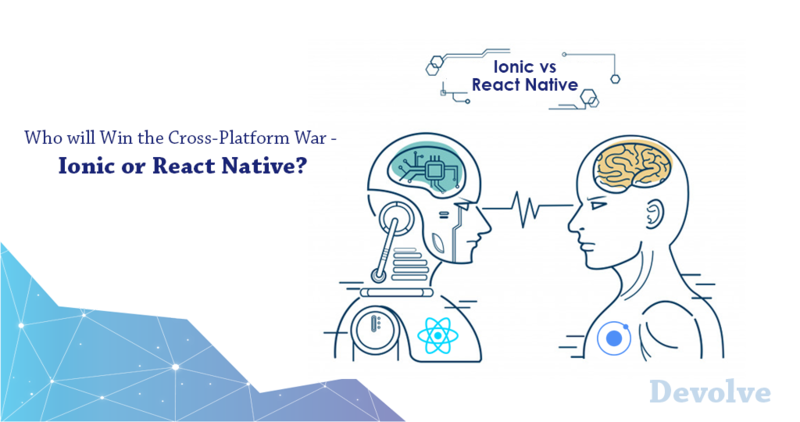 The question of ionic vs react native calls for an individual analysis of each framework. React Native has been created with the objective of making native app building easier. This framework includes view layer consisting of React components that are nothing but small fractions of code which describe the appearance of your app on the basis of input data, which in turn depends on the native platform that the app has been built on. Performance of native apps is found to be better, especially in animation and rendering, than the hybrid apps. This was one of the primary reasons why React Native was created in the first place. Its task was resolving poor hybrid performance issue while improving the otherwise inefficient process of creating native apps. Ionic, on the other hand, proves to be a mobile development framework that was designed for making the app development process easier. It is a typical hybrid development framework that uses web technologies for writing and rendering the apps, for which it requires Cordova or PhoneGap bridges for accessing the native features. It then tries to reproduce native behaviors for offering the best user experience. Reusable code and cost saving: Same code may be used for deployment on Android and iOS, saving cost considerably. Performance: Making use of the GPU, this architecture is well-tuned for mobile devices; improved performance is assured. Huge Community Support: Using this community-driven environment brings in several advantages such as the availability of enthusiastic native and JS developers who can share their expertise and knowledge as well as components. React-like Architecture: The intuitive and modular interface enables developers to examine projects done by others and also build upon those. This makes upgrades and updates easier while increasing flexibility. Furthermore, it requires less time for testers to understand programming logic. Virtual-Dom Support: With two screens – one for code and another for the mobile screen that appears as a result of the code – it is possible to look at the effect of changes immediately. Reloading: Live and easy reloading is possible; there’s no need for refreshing the window, it can refresh the virtual Dom automatically. Ease of Learning and Development: Managed by a strong and huge community of developers and corporations, this enables novices to easily learn and expeditiously develop apps. Angular 4 Compatible: Ionic has been updated to be compatible to Angular4; this provides new features, support for recent version of TypeScript, faster and smaller applications, and much more. TypeScript Compatibility: Updated to work with the recent version of TypeScript, Ionic is empowered to improve type checking and build-time in applications. Ionic is compatible with TypeScript 2.1 and 2.2; it introduces support for mix-in classes and the ability of using async-await, among other advantages. Lazy Loading: Ionic 3 consists of support for lazy loading. While the changes impact navigation and file structure of apps, they result in speeding up of the apps. IonicPage Decorator: The ability of setting up deep links with the use of IonicPage decorator has not only relieved the tedious process of passing deep link configuration to the root modules of apps but it has also simplified setting up lazy loading in apps, setting priority of lazy loading pages, and also customizing the configuration for individual pages. Default Mobile Apps: Creating default mobile app UI functionalities is easy and efficient here. While it is nearly impossible to have a ‘one size fits all’ concept in mobile app development, developers and entrepreneurs may follow certain parameters and thumb rules for choosing the right technology for building their applications. In the quest for ionic vs react native for Mobile App Development, diligent consideration of certain parameters proves essential. The factors such as cost, time, features, platforms, requirements, and team size, when considered according to the specific needs of the project, will help in selecting the appropriate framework that serves the purpose efficiently for Cross-Platform App Development. With technologies racing for accomplishing a place in cross-platform app development, Ionic and React Native are clearly the forerunners. While Ionic proves to be effective for those who wish to achieve excellent performance under controlled budget, React native will be ideal if native-feeling apps is what you look for, inspite of a little elevated cost.